National Eating Disorder Association (NEDA), a national partner, is hosting National Eating Disorders Awareness Week (#NEDAwareness) February 25 through March 3, 2019. We are NEDA to change the conversation around body image and eating disorders! Join the movement and #ComeAsYouAre, not as you think you should be. Learn more about how you can get involved at www.nedawareness.org. One of the best ways to prevent bullying in a community is to lift people up through intentional acts of kindness and inclusion. That’s why Planet Fitness wanted to do something big for Random Acts of Kindness Day on Sunday, Feb. 17. To accomplish the heavy lifting of making “random” acts of kindness more “regular,” Planet Fitness is inviting its Facebook and Instagram followers to tag a friend and comment how they regularly spread kindness. For each comment, the company will donate $5 to PACER’s National Bullying Prevention Center, up to $25,000. The campaign will run from Friday, Feb. 15 – Monday, Feb. 18. In a national study commissioned by Planet Fitness, they found that everyday kind gestures are on the decline. Their social media campaign with NBPC hopes to address this issue and encourage people of all ages to find simple ways to incorporate kindness and inclusion in their everyday lives. Check out the official press release from Planet Fitness. 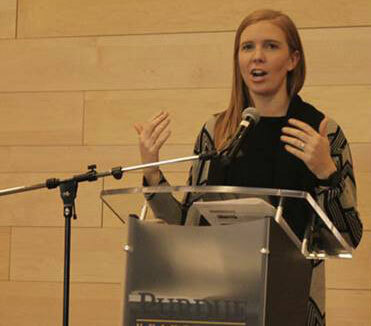 At a recent workshop in La Porte County, Indiana, Bailey Huston, coordinator of PACER’s National Bullying Prevention Center, discussed the best practices of bullying prevention with nearly 100 local educators, advocates, and professionals. Huston instructed attendees on how to properly define and identify bullying, how to navigate the dynamics underlying bullying, and, most importantly, how to effectively intervene and advocate on behalf of those who experience bullying. Her presentation also covered the differences between bullying and conflict, as well as when bullying can qualify as discriminatory harassment. Read the full article by staff writer, Kelly Smith, at The Michigan City Dispatch. Together we can create a world without bullying! The event kit is designed so that anyone can set up a display (in the classroom, library, hallway or event) with print resources to educate and engage participants about steps each one of us can take to help prevent bullying. Each kit has materials for up to 50 participants. Kits are available for $50. Special offer: The 5-poster series from the kit can be ordered as a stand-alone resource. These colorful, educational visuals are excellent reminders for students. The 5-poster series is available for $10. She spoke with experts with backgrounds in bullying prevention initiatives, including Julie Hertzog, Director of PACER’s National Bullying Prevention Center, about the signs many children display if they’re being bullied at school, at extracurricular activities, online or elsewhere. These experts also shared helpful advice about what parents can do to resolve the situation. Read full article at Tourette Association of America website. In a colorful and fun display of support for bullying prevention, King Features Syndicate (a division of Hearst Publishing) called upon its cartoonists to create comic strips to educate readers about what bullying looks like and how to be proactive about bullying prevention. Working closely with PACER's National Bullying Prevention Center, these cartoonists celebrated Unity Day by promoting kindness, acceptance, and inclusion and incorporating the color orange, the official color of bullying prevention, into their strips or featuring storylines that highlight the many different forms of bullying that take place today. Led by Isabella Bannerman — and the Six Chix creative team of Martha Gradisher, Susan Camilleri Konar, Mary Lawton, Benita Epstein and Stephanie Piro — more than a dozen King Features cartoonists participated and stood with millions of others around the world to say no to bullying. Learn more about NBPC’s Unity Day Resources at www.pacer.org/bullying. The campaign has several colorful and creative images to include with responses as individuals contribute to a kinder, more accepting and inclusive culture through their thoughtfulness. PACER partners Disney and ABC are choosing kindness this October as throughout the month, Disney and ABC are releasing PSAs with fan favorite stars calling on audiences to spread kindness, acceptance and inclusion for National Bullying Prevention Month. Carrie Underwood, seven-time Grammy Award-winning artist, and Ryan Seacrest, award-winning radio and television personality, serve as ambassadors of this campaign in partnership with PACER’s NBPC. In addition to the PSAs, several stars offer heartfelt testimonials of their personal experiences with bullying. From being called names to being teased about their weight to being judged by the color of their skin, these videos offer audiences a glimpse into an epidemic to which their favorite stars are not immune, as well as uplifting messages on how to take a stand for those being bullied around them. Among the stars featured in the videos and photos throughout the month are Kelly Ripa (“Live With Kelly and Ryan”); Taran Killam (“Single Parents”); Leighton Meester (“Single Parents”); James Roday (“A Million Little Things”); Ron Livingston (“A Million Little Things”); Randall Park (“Fresh Off The Boat”); Nathan Fillion (“The Rookie”); Raven-Symoné (“Raven’s Home”); Issac Ryan Brown (“Raven’s Home,” “Kim Possible”); Sasha Pieterse (“Pretty Little Liars: The Perfectionists”); Janel Parrish (“Pretty Little Liars: The Perfectionists”) and many more.